Last week, FightHype published a list of the Top 10 American-born boxers. Now it's time to list the best from the rest of the countries in the world. This list is a bit larger because there is a wider range of fighters to choose from. So without further ado, The Boxing Observer presents to you the Top 15 Internationally-born boxers. The 28-year-old Argentine burst into the spotlight after he made Victor Ortiz quit on national television in their 2009 war. Relatively unknown before then, his only losses have come to rugged Ukranian Andriy Kotelnik and England's rising star Amir Khan. Maidana never stops coming forward and has that "It" factor that fight fans crave for. He is the most exciting fighter in the 140-pound division and Robert Guerrero will have his hands full with him when he makes his debut at junior welterweight on August 27th. The WBA featherweight titlist is the longest reigning world champion, having successfully defended his title 14 times since winning it in 2003. 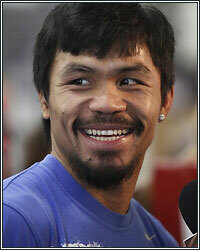 He has avenged both draws on his record and has a significant victory over Juan Manuel Marquez. John has been primarily fighting in his home counrty of Indonesia as he is a huge draw and the country's biggest sports star. The only way John may leave the island to fight is in a showdown with Yuriorkis Gamboa down the line. John makes too much money right now fighting in Asia to risk coming over for significantly less. Adamek's only defeat came in 2007 as a light heavyweight against Chad Dawson. The Poland-native moved up to cruiserweight after that loss and became tops in the division. Not satisfied with that, he is now a full-fledged heavyweight and has earned himself a title shot against Vitali Klitschko on September 10th in Poland. Not many people give Adamek a chance in the fight, but expect him to win a few rounds in his upset bid of Dr. Ironfist. This one could be closer than most experts think. This Cuban defector may be the most entertaining fighter in the world today. He is a fast-talking, lightning quick, power-punching sensation. He is just as willing to take a punch than dish one out. Gamboa has come off the canvas numerous times to win and shows no signs of slowing down anytime time soon. The world gets to see him again in action against Daniel Ponce De Leon on September 10th. This tough and rugged Brit has constantly passed test after test. His only loss came in the Super Six Tournament against Mikkel Kessler in Kessler's home country of Denmark. Froch still contests he won that fight, but was jobbed because he was on foreign turf. The wins on his resume include Jean Pascal, Jermain Taylor, Andre Dirrell, Arthur Abraham, and Glen Johnson. He looks to add one more big name in the finals of the Super Six Tournament...Andre Ward on October 29th. Following his knockout loss in 2008 to Breidis Prescott, Khan has bounced back winning 8 in a row on a carefully crafted path. Now under the tutelage of Freddie Roach, "King" Khan is getting better with every performance. His 2010 fight of the year with Maidana proved Khan has an itch to show he has a strong chin, and his latest performance against Zab Judah was nothing short of brilliant. It may not be long until Khan is at the top of this list. Bute is regarded by some as the best super middleweight in the world. We'll see in due time as he is set to face the winner of the Showtime Super Six tournament between Ward and Froch. In the meantime, Bute keeps lining them up and knocking them down. A showdown with Glen Johnson seems like the next logical step for Bute, but Johnson felt low-balled by the latest offer from Bute's promotional company, Interbox. If your first thought was "Who? ", don't worry. You aren't alone. Wonjongkam is currently regarded as the best flyweight in the world. He has never fought outside of Asia, which is why he remains unknown to the American public. He is 34 years old and still going strong. Still not convinced? Please refer to his unbelievable record against stout competition over a 17-year pro career. Remember that the flyweight division is not exactly flourishing in the United States. The only two losses Cotto has suffered have been to Manny Pacquiao and Antonio Margarito. While avenging the Pacquiao loss may never happen, he can certainly right the potential wrong suffered at the hands of Margarito when the two meet again December 3rd at Madison Square Garden. Remember, it wasn't until after the fight with Cotto that Margarito was caught using illegal hand wraps. Marquez is one of the all-time greats and a sure-fire first ballot Hall of Famer. This man took Manny Pacquaio to the brink on two separate occasions in fights many people thought Marquez won. He has a 3rd chance at Manny in November, and if he can pull off the upset, he may cement himself as the 2nd greatest Mexican fighter of all-time (behind Julio Cesar Chavez) if he hasn't already done so. The elder Klitschko has won 15 of his last 16 fights. The loss came in 2003 to Lennox Lewis when the fight was stopped due to a cut. Most feel Klitschko was on his way to winning that fight. He has won 10 fights in a row, all in dominating fashion (8 by KO), and all of which were championship fights. Just a reminder, this list is not who is the most exciting, but who is the best in the sport. Adamek gets his shot at Vitali on September 10th in Poland. A lot of people would have Martinez higher on this list. I might have agreed with them about 9 months ago when he knocked Paul Williams completely silly, but unfortunately, he falls victim to the cynicism that is professional sports and the "what have you done for me lately" attitude. Sensational wins over Kelly Pavlik and Williams look good on paper, but look at the two fighters since they fought Martinez (Pavlik has had personal problems with rehab stints for alcohol and Williams is coming off a very questionable decision over Erislandy Lara). Unfortunately for Sergio, he might be leaps and bounds better than everyone else right now and not many people are willing to step up to the plate. Darren Barker on October 1st should be another victory for "Maravilla." If you don't know the name, you aren't the only one. That's because he isn't even the best fighter in his own country (that honor belongs to Manny Pacquiao), but you should know that "The Filipino Flash" is the best bantamweight in the world right now, and it won't be too long until he has to move up to secure a big money fight at 122 or 126 pounds. His only loss came in his 2nd pro fight when he was 18 years old. With his promotional issues now resolved with Top Rank, Nonito makes his return to the ring in October after a devastating knockout win over Fernando Montiel in his last fight. Forget the fact that the heavyweight division is horrid, the man has won 14 fights in a row (12 of those were championship fights), and has made it look relatively easy in doing so. Who cares if he is boring to watch? This list is about who is at the top of the sport and not who is the most fan-friendly. It is incredible what Manny Pacquiao has done over his career and he is the only guy on this list who can make the case for being at the top of the pound-for-pound list. World championships in 8 different weight classes make Pacquiao an easy choice for #1. What do you think? Send your comments and thoughts to dkassel@fighthype.com, "Like" The Boxing Observer on Facebook, follow us on Twitter @BoxingObserver, and follow my personal blog at http://boxingobservers.blogspot.com.